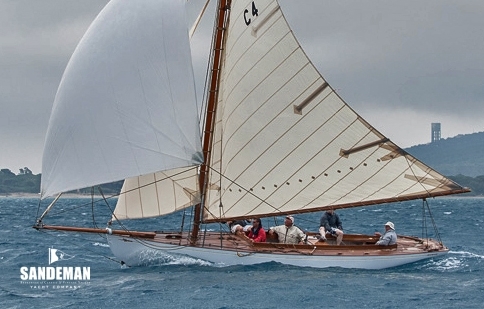 JAP is a Cork Harbour One Design by William Fife III, superbly restored by Fairlie Restorations in 2002 for an experienced Irish yachtsman. 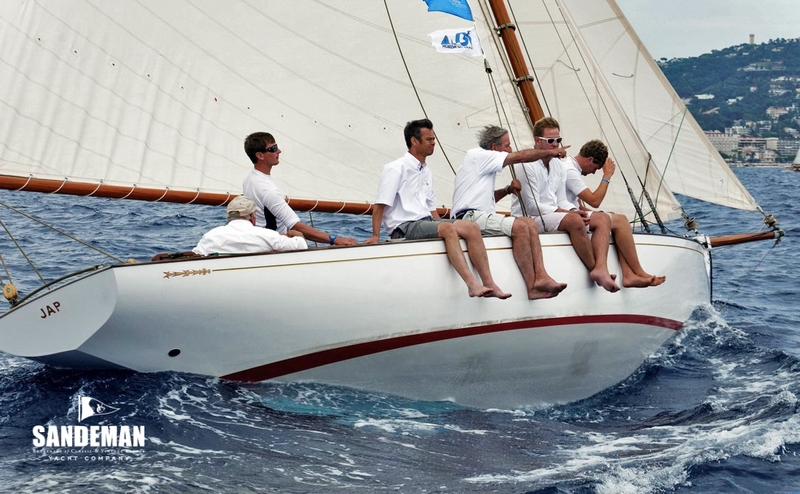 The result is a much admired yacht, which with her simple, pure lines, generous freeboard and powerful rig, carrying no less than 600 square feet of sail, has successfully taken on the might of vintage gaff class yachts in the Mediterranean and won – and there most recently with her current owner a 1st, 2nd and 3rd so 2nd overall in Class at the Voiles de St Tropez in October 2014. Storage in her own custom fitted 40 ft container has helped to keep this vessel in 1st class condition and enables easy shipping between venues. 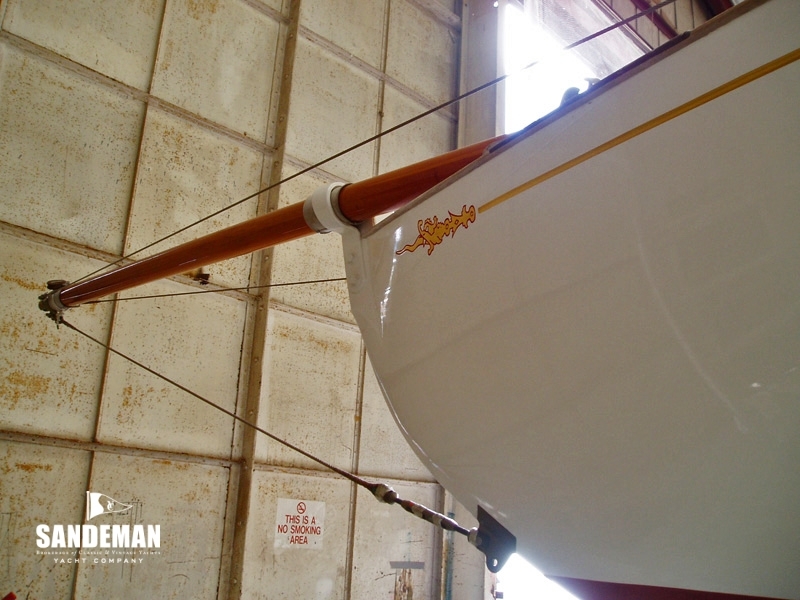 The designer Doug Peterson was known to comment on how wise a man William Fife must have been to create a yacht in 1897 anticipating the convenience of fitting her into such a container for use in the 21st century. 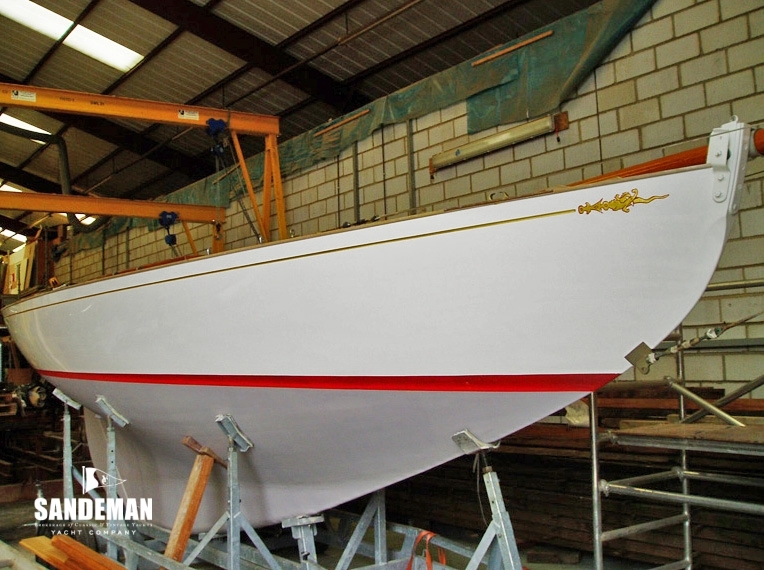 The Cork Harbour One Designs were first commissioned by six local sailors for racing evenly and without handicap. Within months of the first series the competition promoted further interest and four more were commissioned. 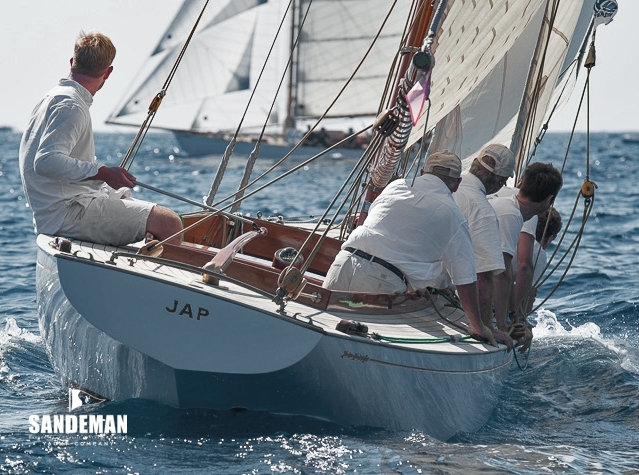 JAP was the ninth to be built, accepted into the class in 1897 and the yachts raced seriously until the 1950s. Seven of the boats survive to this day. Although not racing among themselves as a class but racing among others, the present and former owners have enjoyed an impressive recent record. 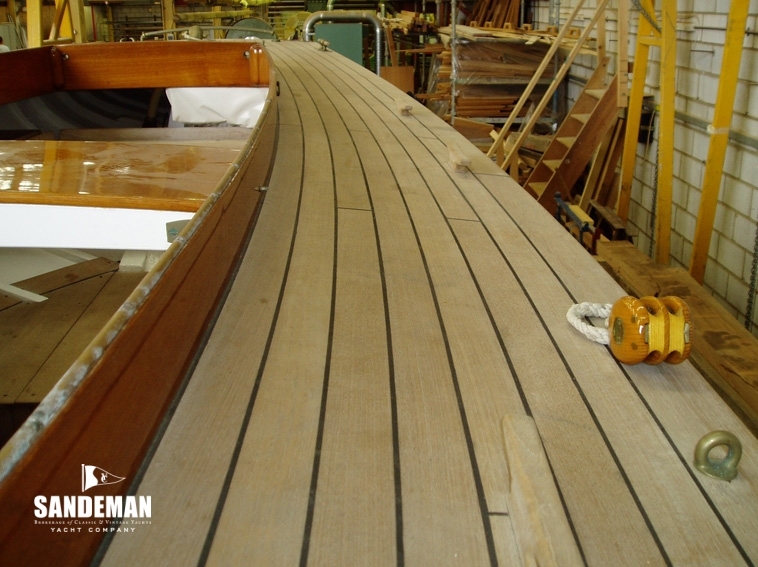 A racing yacht is designed to achieve maximum speed through the water - it combines the purest aesthetics, the most durable of materials and a “je ne sais quoi” - collectively these are the qualities which intensify the mathematics of a perfect hull. 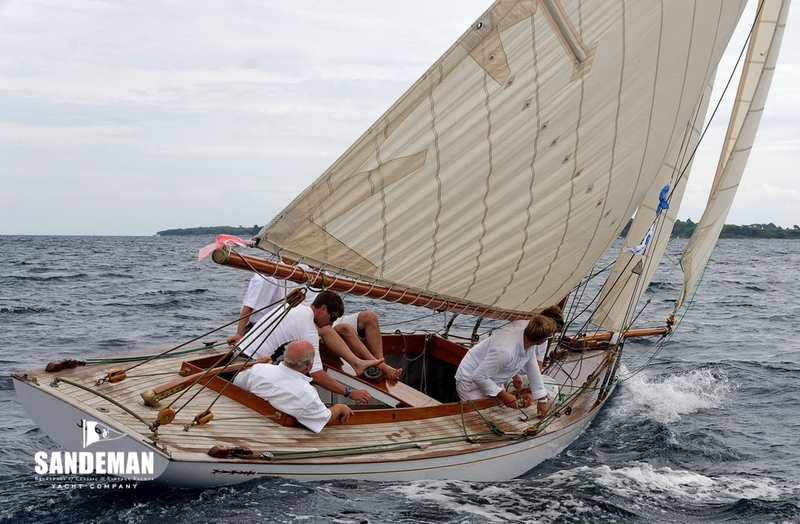 JAP is the diminutive, but feisty, Cork Harbour One Design built in 1897, conceived with all such attributes in mind. Built to the renowned specifications of William Fife III and commissioned by a Cork “Justice And Peace” the late nineteenth century Irish term for what we would know today as a Justice of the Peace. Hence we have the solution to a name which seems distinctly alien to the late nineteenth century soft colloquials of Maureen, Elsie, Sybil & Colleen. Alicia St Leger's history of the Royal Cork Harbour Yacht Club writes of P.F. Donegan, an early pioneer of the Cork Harbour One Design, describing how “towards the close of the season of 1895, the idea of forming a new class of inexpensive type of boats was discussed”. An informal assembly of yachtsmen met at the Imperial Hotel, Monkstown in Southern Ireland to consider the idea. One Design Classes were being constructed on the Clyde and on Belfast Lough at the time. Other designs, such as One or Five Raters were deemed either too expensive, too big or too small. A boat capable of taking four up - a relatively easy number to assemble - that could be built for around £100 would, it was thought, be a feasible solution. A meeting was later held at the Victoria Hotel, Cork where the idea was debated in detail with the result that a syndicate of five was formed, one of whom was Adolphus Fowler, who commissioned JAP in 1897. Fowler held the title of Justice And Peace – an acronym which seems to suit JAP to a T.
JAP is today a thing of beauty - to sit quietly in the simplicity of her deep nineteenth century hull there is indeed a feeling of peace - the combination of honest material, fitness for purpose and pure integrity seems to characterise her 'justified' design. St Leger writes that this One Design proved to be “the strongest class racing in the harbour up to the First World War and for many years afterwards.” Fashions in boats, like everything else, change; by the late 1980s JAP was lying abandoned in a mud berth in Cornwall. 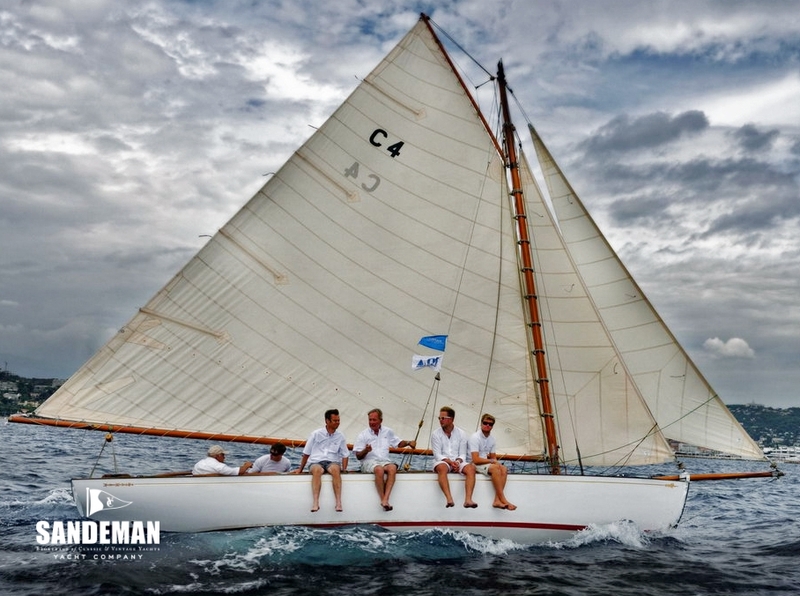 She was bought by Paul Kingston in 2001 and subsequently by Clayton Love III, the enigmatic Commodore of the Royal Cork Yacht Club from 1968 to 1971, and past President of the Irish Yachting Association (now the Irish Sailing Association). 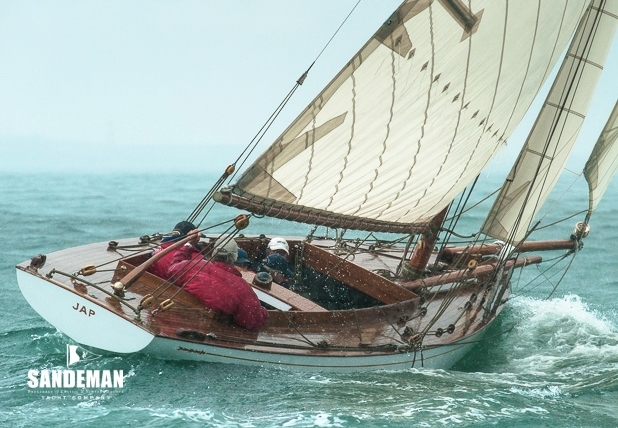 Clayton had JAP restored to her original gaff rig by Fairlie Restorations on the Hamble. JAP had a successful first season in the Mediterranean gaining a second on her first outing at the Imperia Regatta, a first overall in St Tropez and a second in the prestigious Voiles de St Tropez. Clayton's ownership of JAP was to set the tone for her future successes. 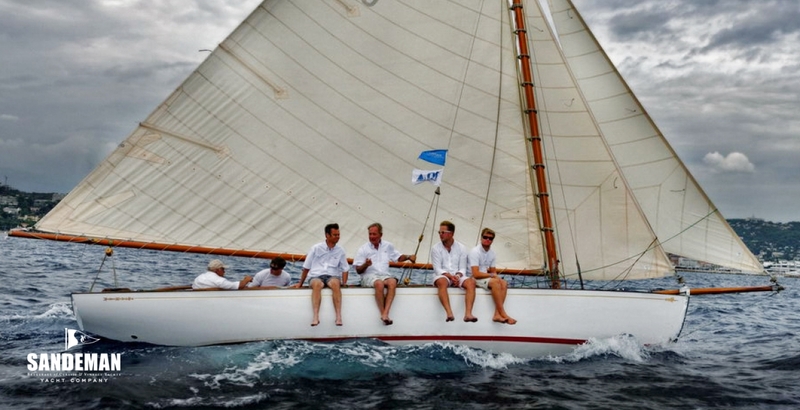 In 2010 Clayton sold JAP to David Sherriff, a Soling, Daring and Dragon sailor with an eye for a pretty boat and a rapaciously competitive nature. David raced JAP under Corinthian ideals with a young crew Toby Mumford and Mark Yeabsley, and the occasional senior figure. she was sometimes helmed by the Olympian Andy Cassell, and once or twice under the spiritual (Cork) mentorship of Harold Cudmore. JAP now combines her ecological credentials with winning ways. She is economical to maintain being only 30 ft overall, and post her extensive high quality restoration requires only routine maintenance. She has her own habitat - her home is a modern Sea Cell 11 transport container - with a sustainable bamboo floor. Buckets of sea water keep her moisture levels at a constant, her solid oak mast, her equipment, natural hemp ropes, and spares, are stored alongside her in the container. It's a neat solution ingeniously devised by Clayton Love. JAP has subsequently morphed into a modern phenomenon which is transportable around the world. Made of 100 natural materials - oak, English elm and pine - she has the finest of pedigrees, and sports the synonymous red and gold Fife Dragon emblem to her bow. With the prettiest of sail formations she carries over 600 square feet of sail, using only the elements of wind and water for her speed. There is not a cloud, nor an element of pollution to her. 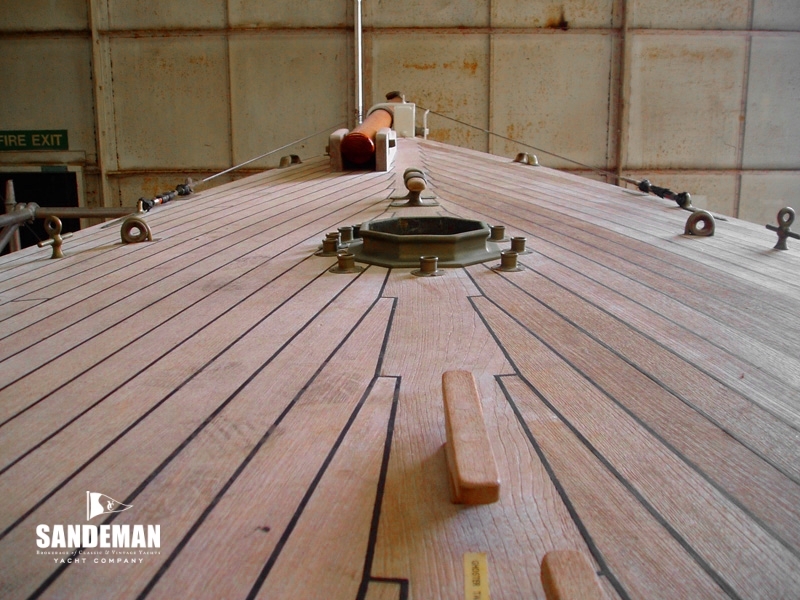 A boat built in 1897 - now restored two centuries later - has finally come into her own in the twenty-first century. She is upcycled in the most modern sense of the word - she performs, AND she wins. Under David Sherriff's ownership she has achieved outstanding successes. It is believed that JAP is the only boat ever to have won five straight races of the Classic Regatta in Cowes TWICE - in 2012 and 2015. Sherriff is the proud owner of not one but two Panerai watches. 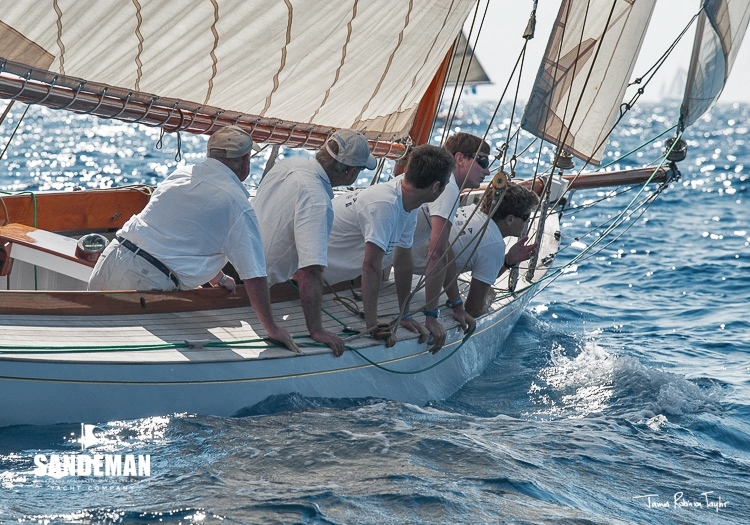 So popular was her first win in the Classic Regatta of 2012 that on the final day of racing, this smallest and oldest of the Classic fleet was serenaded out to the start to the cries of fellow contestants shouting “Go JAP Go!”.Crew members are sometimes lucky enough to be given the coveted JAP Jacket. 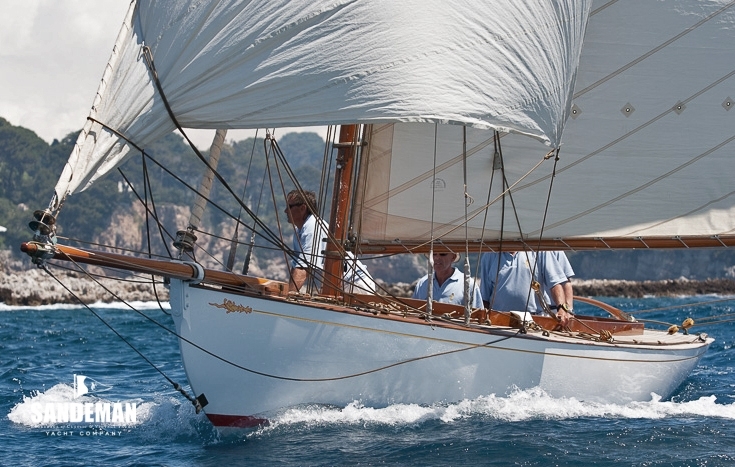 In St Tropez (2014) where she came second in her class in the Voiles de St Tropez JAP was given the honour of leading the contenders of the Gstaad Yacht Club annual race out into the bay, as the oldest and smallest of the Classic fleet. Sherriff, whose life is water and boats (he was responsible for bringing about the Redgrave Pinsent Rowing Lake at Caversham, the headquarters of British Rowing, and was the 10 % enabler for the project) brings her out to play occasionally. In time JAP will need a younger owner to carry her mantle forward. Owning JAP is like having another member to your family, and her family is a yachting dynasty. 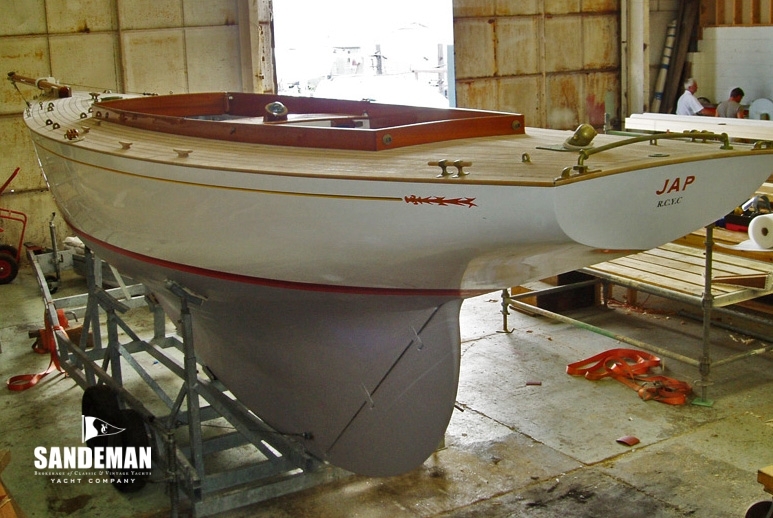 It has been said that “No better boats were ever built ... for their size they were truly wonderful sea boats”. There's an element of gold dust to JAP ... or perhaps it's the Irish in her - who knows ... As a boat born to win - 119 years later - she is, and has become, a contemporary legend. 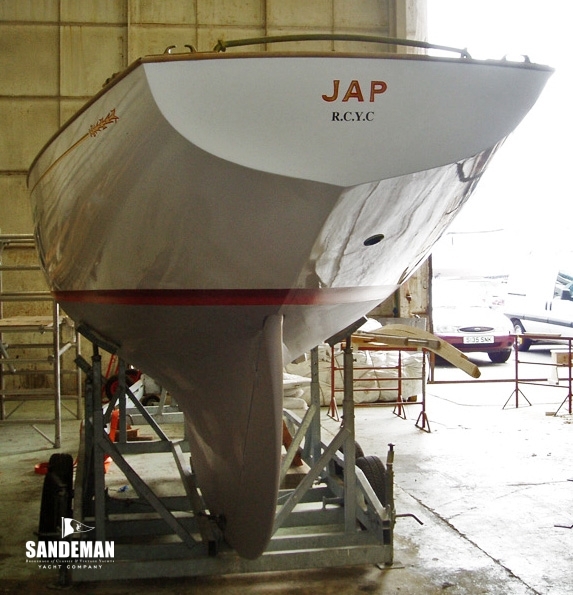 - Boat yard trolley to hold JAP with straps and fitting to secure inside container with airbags.